Iguana were first reported in Miami, Florida in 1964. Not long after they were spotted in the Keys. 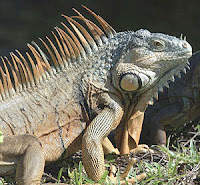 In the '80s and '90s, iguanas became popular pets, but many people couldn't deal with those that grew bigger than their family dog. Now they are common in waterfront subdivisions in Broward and Palm Beach counties. In today's Washington Post, was an article by the Associated Press, Iguanas hunted in Bahia Honda, suspected in disappearance of Miami blue butterfly population. "For more than a year, Bahia Honda State Park biologist Jim Duquesnel traversed the nature sanctuary with two hopes. He wanted to see a Miami blue butterfly and rid the Florida Keys outpost of as many iguanas as he could. No confirmed Miami blues have been seen on Bahia Honda since July 2010, and with each passing day it becomes less likely any exist there. The U.S. Fish and Wildlife Service last August issued an emergency listing of the Miami blue as an endangered species and three similar butterflies — cassius blue, ceranus blue and nickerbean blue — as threatened." More of the article. As stewards of the outdoors, we all need to be concerned when ever a new species of plant or animal is introduced to the environment. It can cause devastating effects. FL Hunter Safety is a lifetime certification. Teaching teachers how to navigate.